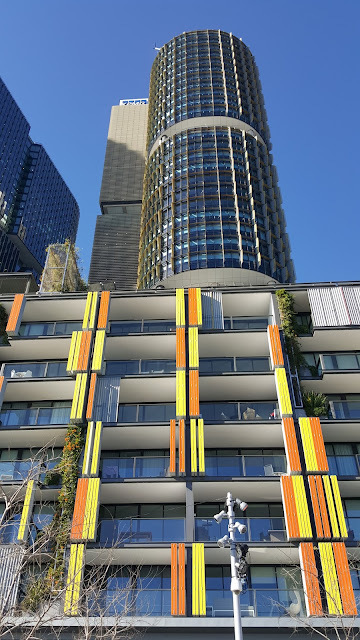 Tower Three is one of three new skyscrapers known as International Towers, in the inner city suburb of Barangaroo. The three towers have been built in the block bounded by Barangaroo Avenue, Watermans Quay, Scotch Road and Exchange Place, with the walkways Shipwright Walk and Mercantile Walk between them. This is the view from Wulugul Walk along the foreshore, with the Alexander Residences apartments in the foreground. Fascinating combination of curves and angles against the blue sky. It looks very modern - nice shot. Modern display, really lovely too. A great perspective shot and I like the splashes of colour. Hello, what a cool looking tower. Love the shape. Great photo. Happy Friday, enjoy your day and the Labor Day weekend! Great perspective and like the colours of those shutters too.